A few new additions lately. Finally after 5 months of waiting my Korg Arp Odyssey has arrived. SO… first impressions. Sounds good! Nice fat analog sound. Best ring modulator sounds I have from any synth including the modular. I like the first filter type the best. It’s really big and fat where as the others have too much self oscillation when you turn the resonance up. They are also quieter and a bit thinner sounding. Some cool features, in fact it’s just laid out differently from other synths (much like the MS-20) so that causes you to think about differently when programming which is great for coming up with unusual sounds. One of my favorite features is that you can trigger the sample part of the Sample and Hold with the keyboard. When you apply this to the filter you get a different sound with every note you play. Very cool! The carrying case is actually really nice. Not a true road casce but a nice hard shell to keep it safe without adding a ton of extra weight if you’re lugging it from gig to gig. The keyboard: Hmmm. I think a lot of people have already mentioned that they don’t like the mini keyboards so I wont keep repeating that… but…. I don’t like it. It is a bit bigger than the ms-20 mini keyboard so it’s a bit easier to play but the problem is, now my brain has to adjust for 3 different keyboard sizes!! I find myself scared to play wider intervals because I don’t know what key I’m about to hit. Jumping from a lower C to a higher one… am I going to hit the C or will I hit a D? I just want to play, I don’t want to have to keep adjusting from keyboard to keyboard. And I will say that sitting beside other keyboards, it does kind of look like a toy. A very nicely built toy, but still, not quite professional. Now here’s the part I haven’t heard anyone else mention about the keyboard yet: When you play, it sounds like there is an echo. This is because it can be “duophonic”. It’s not really duophonic, the second note just steals one of the oscillators. That may seem like a cool thing at times but the problem is when you are trying to play a monophonic line you have to completely lift each finger from the keyboard before hitting the next note, otherwise that new note will first steal an oscillator from the last note, then when you let go of the previous note the oscillator left behind jumps to the new note, so you hear the new note twice. Even with the much smaller keyboard I find it difficult to play that way. I think I understand now why Cory Henry did such sparse playing in his NAMM demo. It’s a very annoying part of the instrument and it will be very difficult to get used to it. I wonder if there is some way to turn that off. I personally don’t think I will often use that duophonic part, only really with ring modulator sounds. Note: If you have portamento on, it will not be applied to that second oscillator when you add the second note. It will just jump right to that pitch. The slide only happens with the full voice (both oscillators). 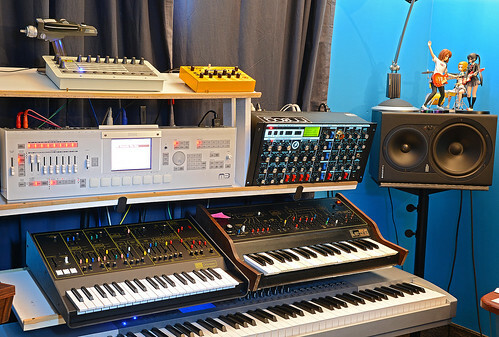 Small note: I’m so glad I got the Arp Axxe. It is definitely a bit brighter sounding than this Odyssey and that is very useful for lead lines. In the box are 2 manuals (don’t know why yet), a note from David Friend, the power supply, and 2 small (short) patch cables (don’t know why yet!). Moving on now, my Ensonic ESQ1 also arrived on that same day. I don’t need to say too much about it but in brief: The battery is dead so it doesn’t save patches. I have already installed a AA battery holder to replace the harder to change lithium-ion battery and patch memory is back. It definitely has a slightly weird sound I remember from the last time I played one in 1988. It’s almost like it’s going through a comb filter. I guess it’s just part of the way the digital oscillators work. But I will say… it’s pretty amazing when you get into programming it! Loads of options! 3 oscillators per voice, 4 LFOs, 4 envelopes, the filter sounds really good and you have something like 12 different waves per oscillator. And a built in sequencer, if you like that sort of thing. And I found that programming it is actually VERY easy even though there are many menus, or at least “screens”, to go through. It’s definitely an amazing, under rated keyboard with quite a bit of potential. I also bought an Electrix Warp Factory vocoder after hearing how amazing it was, however my first experiments were less than spectacular. You can add a formant type filter to sounds which can be cool at times but so far I’m not finding it to be very useful as a standard vocoder. It is nowhere near as useful or versatile as the Electro-Harmonix v256. I may be doing a demo and unboxing video for the arp odyssey in the near future.